Services to the marine industry. Package" that includes every- thing from complete systems surveys, inspec- tion, certification, upgrades, maintenance and management, through to new systems design, installation and products. Register, you benefit from some of the world's finest marine experi- ence and an organization dedicated to delivering the very best customer service during the entire life of your vessel. We aim to help you maxi- mize safety, protect the environment and lower your risks. Building better business. Climax's line of more than 25 machine tools pro- vides effective solutions for repairs at sea and valuable alterna- tives to costly off- site machining in a*wx- 1 ship repair or refurbishing operations. Shipyard offers vari- ous service works in the field of develop- ment, construction and manufacturing of ships, mainte- nance and repairing of lifeboats, delivery of spare parts. Fass me r-Shipyard has, over the years, turned more and more to new materials such as seawater resistant and/or high quality precipitation-hardened aluminum and aluminum semifinished prod- ucts as well as high-tech fiber composites. Ireland. In busi- ness since 1975, Pare prides themselves on having a deep knowledge of the engineering and technology sectors and an understanding of the skill sets and needs of the professionals who work within them. MWH has been one of the most important manufacturers of valve systems in the world. MWH products for their outstanding perfor- mance and valve. Pantograph wipers, m;. clear view screens *j and associated con- trol systems, with a choice available for heavy duty through to light duty applications. 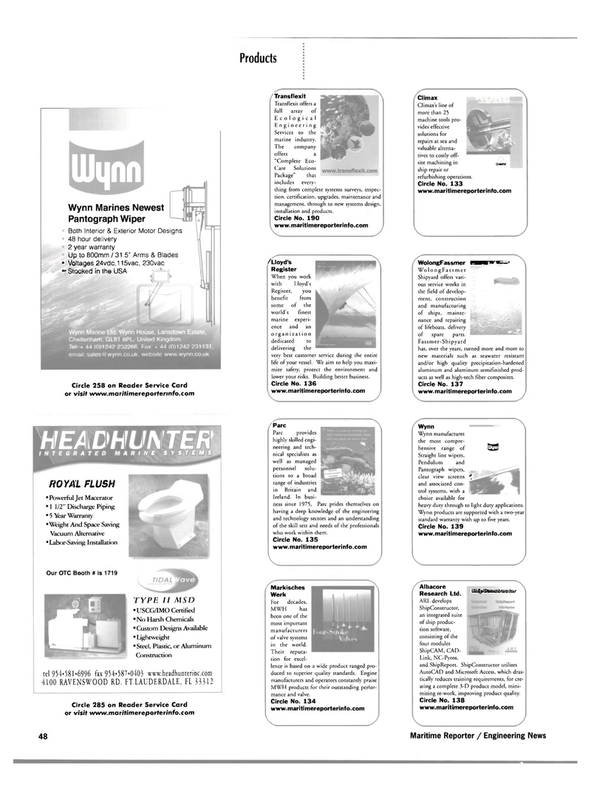 Wynn products are supported with a two-year standard warranty with up to five years. Circle No. 139 www.maritimereporterinfo.com ^JjJjJS^j^JMJGiity Albacore Research Ltd.
AutoCAD and Microsoft Access, which dras- tically reduces training requirements, for cre- ating a complete 3-D product model, mini- mizing re-work, improving product quality.